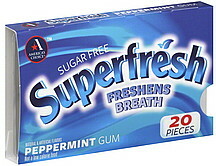 Memorabilia: America's Choice 'Superfresh' Gum? Worst part is it has the Waldbaum's leaf over the "E"... But where's the A&P outline, one might say?